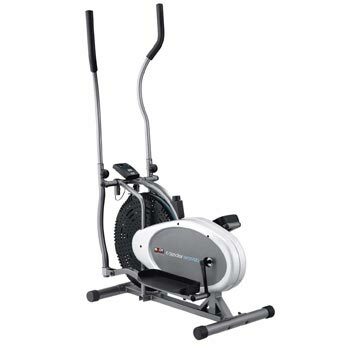 Body Sculpture’s BE5920 fan elliptical trainer is very similar to the Pro XS model in the cross trainer reviews guide, with dual action handlebars for static or free-use to work your arms and the ability to adjust the resistance using a manual tension dial. The frame is made of steel and is ultra-durable, while the footplates are wide and have anti-slip properties. Static or movement allowed with the dual-action handlebars. 100 Kg maximum user weight. If you’ve ever assembled a cross trainer before, you know that it’s a rather tedious process, mostly due to a lack of proper instructions. Body Sculpture ensured that this wouldn’t be an issue by providing in-depth, easy-to-follow instructions. Once the machine is assembled, there is little you have to do before your first workout. Note: Place newspaper around the machine the first time you use it. Grease does seem to come out of the machine the first time, which could stain your carpet. The handlebar design allows you to use the machine the way you want. If you want to work your arm muscles, you’ll be able to switch into dual-action mode, which allows you to move the handlebars during your workout. This is a great option for overall strengthening, allowing the legs and arms to both work in unison during an exercise session. Anyone who is more concerned with strengthening/ toning their lower body can choose to leave the handlebars in static position. Or take a look at some of the 2 in 1 models featured in our home elliptical guide, that combine an exercise bike with a cross trainer. The handlebars can be adjusted using the knob in the front to accommodate users of all heights. In the middle of the unit, there is a dial that can be turned to boost the machine’s resistance. Adjustments can be made mid-workout and will provide a more difficult workout for the user. Using a fan design, this model is quiet and sturdy thanks to the steel frame. This is all controlled through the mode button which lets you cycle through your workout stats. There is no heart monitor present, but most models at this price range seemingly don’t work anyway, or they’re highly inaccurate, so this isn’t a major issue. Finally, the BE5920 comes with a stabilization system to ensure the machine stays in place during a workout. There are no wheels on this model, but the rubber grips will protect your floor, and the 27 Kg weight is light enough for most users to move around with ease. Maximum weight capacity of this model is 100 Kg. Dual action and static handlebars. For some reason, the bolts on this model seem to come loose and require re-tightening after a few months of use. Users will be able to use Loctite on the threads to keep the bolt in place. It’s not a major issue, but using Loctite will ensure that the bolts stay in place for years, instead of months, without coming loose. 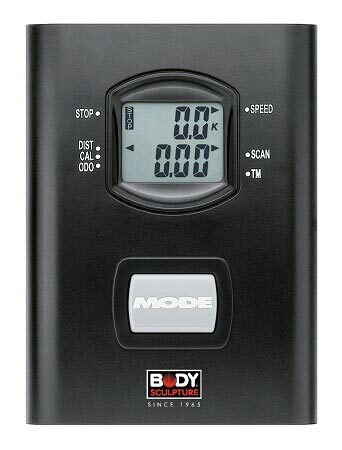 The Body Sculpture BE5920 is affordable, easy to use and the ideal elliptical for beginner and intermediate users.